Do I need any experience to ride? All of the horses at Two-Bit Stable are professionally trained and beginner friendly. Most of our riders have little or no riding experience. The horses know their jobs well and always enjoy taking first time riders. Also, the rides are walk only due to the county guidelines so its more relaxing than adventurous. How many horses are in a group? We can take up to six "rental" horses along with a guide. For larger parties we do have more horses available, but we are still required to go out in separate groups to abide by the county ordinance. You may schedule your ride for either an hour, or an hour and a half (during winter season). Your lesson is NOT counted as part of your riding time, as long as you are arrive the required 15 minutes before your scheduled reservation time. If you are late and there are others scheduled at the same riding time, unfortunately we cannot wait for your group to arrive. It is always a good idea to bring sunblock, bug spray (just in case) and water. Really you can wear whatever is comfortable for you. We do recommend closed-toe-shoes, but if all you have are sandals that's perfectly fine also. Can we run the horses? No. Under no circumstances may the horses be ran on the beach. Not only is it dangerous but it is against the county regulations. There is a $500 fine per rider for anyone caught trotting, cantering or running on the beach. What’s is the weight limit? Our weight limit is 250LBS. We do understand that taller individuals sometimes weigh more than that, therefore we try to be as flexible as possible (10-15LBS). It will depend mostly on the riders height and level of riding experience (able to "keep your weight in your stirrups"). Please feel free to call with any questions or concerns regarding the weight limit. Children must be four years old or under AND be able to fit comfortably IN the saddle with the adult. We will make exceptions for five year olds under fifty pounds. Generally, the adult needs to weigh around 180LBS or less in order for the children to have enough room. Not all of the horses are accepting of double riders. So, if you will have little ones in your group riding tandem, make sure to call further ahead of your desired riding date for your reservation. This way we can be sure to have our "double horses" available. Yes, reservations are required. We trailer the horses down to the beach so we need to know when to be there and how many horses to bring. Making reservations before you arrive or as soon as you get here is strongly suggested due to availablity and weather conditions. We are usually almost full for the week by Tuesday during Spring/Summer season. Many, many times during the busy months visitors call last minute and our schedule is already full. On occasion we do have a cancellation and can fit a group in last minute. We also do take names on a "cancellation list" in case we have an opening. We accept cash, personal checks, Visa, MasterCard, Discover and American Express. A valid credit card is required to hold your reservation. If we end up having poor weather during the time you are scheduled to ride we will either wait it out or try very hard to reschedule. A lot of times it is just a passing shower and we can still get out on the beach... just a few minutes behind schedule. Also, if you have reservations PLAN ON COMING unless we call you. We will ALWAYS let you know if we will need to cancel due to bad weather. If you don't hear from us then you should still plan on being there for your ride. If we cancel because of weather there will be no charges. We require a 48 hour minimum notice for any cancellations, even if it is just one rider. We do this because we need to know how many horses to bring and sometimes we add an extra horse in the trailer just for your ride. Also, we often have to turn guests down due to being booked already so if we have a chance to fill your spot we need time to do it. Rides cancelled less than 48 hours in advance or "no shows" will be charged full price on their credit card on file. We are on EASTERN TIME. Please be aware that we are very close to the central time border and your cell phone may not adjust depending on which tower it's using. Unfortunately, if your party misses the ride because of a time mix up, we do still charge full price for your ride. Please feel free to call and ask what time it is here at any point before your ride! We always send out an experienced friendly guide with our groups. Yes, we invite you to take as many pictures as you would like. Your guide will also use your camera to take pictures at the turn around point. We also offer photo packages for our rides. Yes, of course! We do ask that you only bring carrots for treats. Some of the horses have an intolerance for sugar. Carrots are safest. Is it customary to tip our guide? Yes, gratuities are welcome and appreciated. We pride ourselves on having healthy, happy, spoiled horses. Happy horses make happy beach rides! 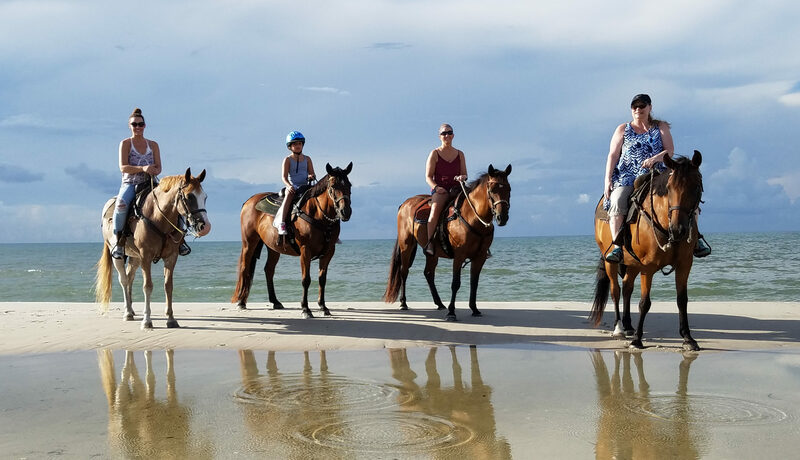 2019 Copyright Two-Bit Stable Horseback Riding on the Beach. Blossom Feminine by Blossom Themes. Powered by WordPress .